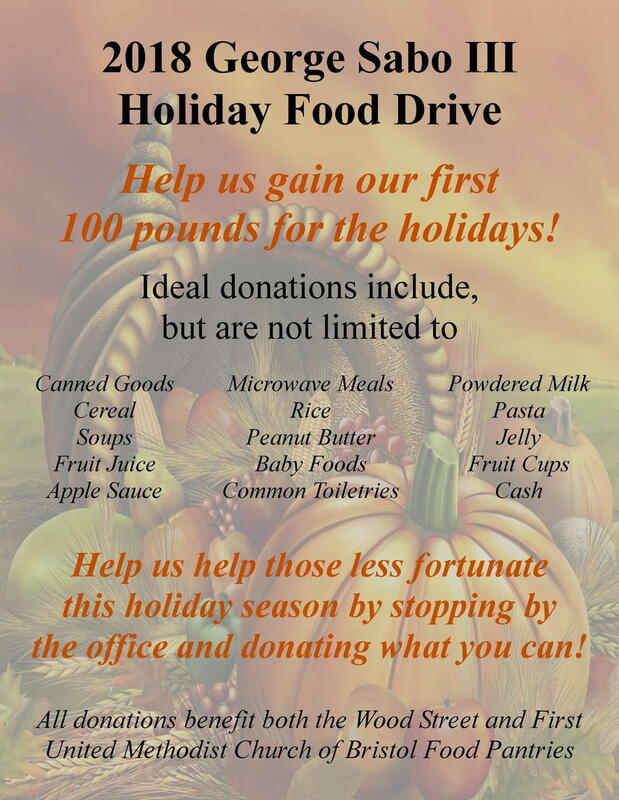 November marks the beginning of our yearly Holiday Food Drive here at the office. Each year since 2008, we have collected hundreds of pounds of food, along with monetary donations, to help those less fortunate. We're extremely proud that all of our past food drives have been great successes. The first two years of our food drives, one of our patients, George Sabo III, showed tremendous generosity contributing nearly half of the food donated by himself! Sadly, George lost his battle with Hodgkin's Disease in October, 2010. Since then, we've renamed our Holiday Food Drive in his honor to celebrate George's memory and generosity. We ask that you please help us in reaching our goal of collecting 500 pounds of food to donate. This year's donations will benefit both the Wood Street and First United Methodist Church of Bristol's food pantries here in town. The holidays are one of those times of the year that we can reflect back on, and be thankful for, all that we have such as family, friends, a roof over our heads and food in our kitchens. According to the Bucks County Housing Group, the people who utilize their food pantries are choosing between eating and putting gas in their car to go to work. Sometimes we all have it a little hard, but there are many people out there facing hardships who are unfortunately worse off than us. Let's do what we can to help them this upcoming holiday season. donations for our Food Drive at their location at 201 Pond Street here in Bristol Borough! Some of the ideal foods for donating are: canned goods, microwave meals, soups, powdered milk, rice, cereal, peanut butter, jelly, fruit juice, baby foods, pasta, applesauce and fruit cups. Everyday toiletries are also great donations that many people don't think of when donating to food pantries as well. For those who cannot donate a canned good, we will also be accepting monetary donations as a $1 donation to a food pantry can provide up to 4 pounds of food!